I must admit, I feared for The Joy Formidable towards the end of the Big Roar cycle. It might have began with a sea of critical acclaim and a thoroughly impressive debut LP, but come the end of 2011 the Welsh trio were visibly and audibly floundering; their live shows grinding to stagnation as month upon month wringing the same 10 or so songs gradually took its toll. The enthusiasm remained, but it was patently obvious the band was approaching burnout, with the million dollar question being whether or not they could pick up the pieces ahead of their eagerly awaited comeback. Try though it does (oh, it really does try...), Wolf's Law is a record which fails to provide concrete answers - a curious document of an outfit who are thriving commercially but toiling in practically every other aspect. Even for those who didn't witness their deterioration, it's immediately clear this is a very different group to the one which broke through two years ago. Gone are the joyous, addictive anthems in the ilk of "Austre," "Cradles" and "Whirring," replaced by a plethora of unconvincing hooks and week choruses, while the exhilarating jams which bookended their best songs are also conspicuous in their absence. It's not at all reactionary to say their Midas touch seems to have deserved them, but despite looking for all the world like the classic 'sophomore slump,' this is in fact a record which pulls of a commendable and to a degree successful cover-up job. Perhaps mindful of their own creative dearth, this material by and large sees The Joy Formidable attempt to curb the backwards momentum with sheer muscularity, essentially abandoning those initial pop flurries in favour of a more thick-skinned approach. This change in emphasis is perhaps best exhibited on early cut "Cholla," whose huge throbbing riffs and thudding basslines do a fine job in deflecting the spotlight from an arrangement which is otherwise flimsy at best. Along with beasts like "Maw Maw Song," it's a shift which enhances their rock credentials tenfold, not least because it's also charged with offsetting a wave of strings, harps and keys which on the whole are completely excessive and if anything detrimental. In fairness, there are also a handful of moments where such a salvaging job isn't necessary. Opener "This Ladder Is Ours," for example manages to recall a portion of The Big Roar's spark (it's a fair bet it was penned early on in the writing process) while "The Leopard And The Lung," makes a valiant - albeit not entirely fruitful - bid to emulate the splendour of "The Greatest Life Is The Greatest Shade" - though in truth their regression acts are welcome exceptions as opposed to pattern. 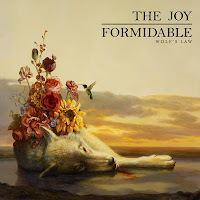 Another one-off which is perhaps more indicative of The Joy Formidable's current plight is "The Turnaround," which turns the volume down in its attempt to craft a more reflective conclusion. Unfortunately, the outcome could scarcely be more adverse; its lifeless form destined to lumber even without the choking string ensemble, which succeeds only in bogging its dregs down even further. In a bizarre way, though, Wolf's Law's biggest victory may in fact be that these troughs don't occur more frequently amid of such an obvious creative rut - never mind the fact its papering over by and large proves rather enjoyable. It doesn't depict a bright future, and isn't a trick they're likely to get away with again, but nevertheless manages to make the best of a decidedly bleak situation. Wolf's Law is out tomorrow.